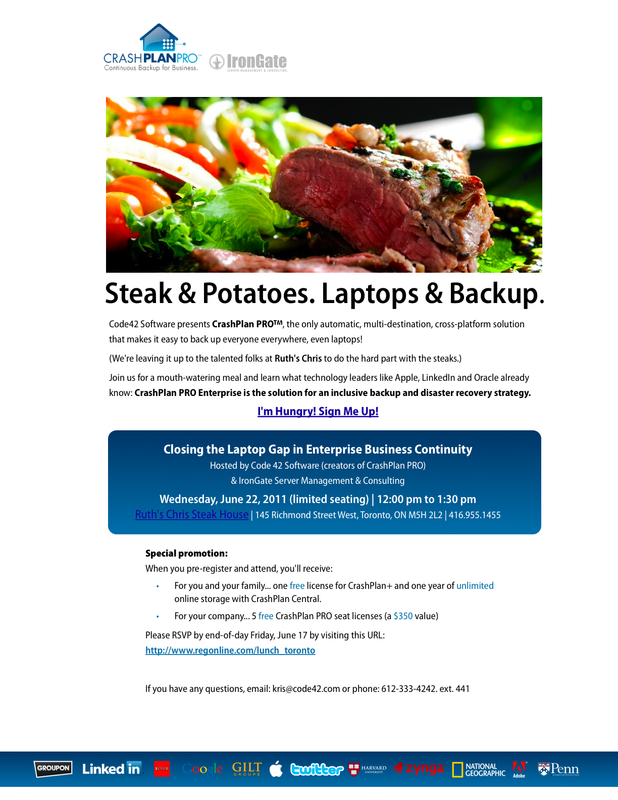 IronGate Server Management & Consulting is pleased to confirm a contingent of senior sales and technical staff from Code 42 Software, makers of the award-winning CrashPlan PROe enterprise-class backup software, will be joining us as we launch the Canadian “Steak & Potatoes, Latops & Backup” Lunch-n-Learn series, kicking off in Calgary, Alberta on Wed, June 8th, 2011. We will also be touching down in Toronto, Ontario on June 22nd, with additional dates and cities being confirmed in the near future. CrashPlan PROe is an extremely efficient and secure multi-destination backup and disaster recovery solution, easily handling the needs of Fortune 500 and 1000 enterprise businesses worldwide, with tens of thousands of systems being protected at any given moment. Engineered to outperform classic tape-based backup systems at a fraction of the ongoing cost, CrashPlan PROe has been aggressively tested and ultimately selected for mass deployment within such recognizable organizations as Apple, Google, LinkedIn and Stanford University. If you are responsible for the ongoing management and protection of more than 75 client or server nodes within your organization, running Linux, Windows, MacOS or even Sun Solaris, you owe it to yourself to join us in Toronto on June 22nd for our interactive presentation. You’ll find that we’ll satisfy both your mid-day appetite AND your need for a solid, scalable, multi-destination backup platform - handily protecting even your traveling laptops.